International coverage expanded to include 60 International banks in Austria, Belgium, Denmark, Greece, Ireland, Italy, Netherlands, Portugal, Spain Sweden, Switzerland and Australia. Historical data is available using our charting tool. Coverage now 1,000 US and International Banks. 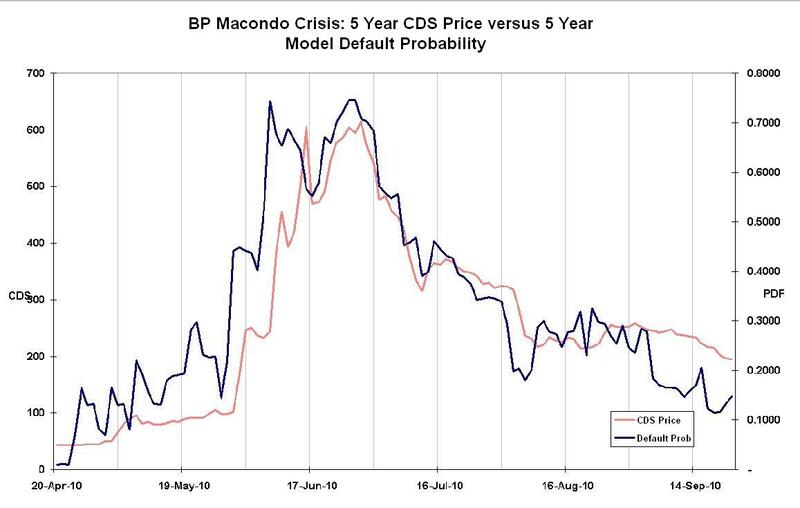 BP's Gulf "Macondo" disaster evaluated with real-time data using the www.FirstKnow.It Excel User Model shows the model led the CDS market by about a week during the crisis. This is for this massive credit event which provoked huge trading in BP's CDS. A chart can be seen at this link. International coverage expanded to include 320 International banks in Canada, UK, France, Germany, Japan and India. Historical data is available using our charting tool. International coverage expanded to include 1,500 Indian companies. Historical data is available using our charting tool. International coverage expanded to include 700 US banks. Historical data is available using our charting tool. Firstknow.It adds its PeerVue™ feature mapping asset volatility, indebtedness and rating curves to provide a unique insight into the risk profile of entire sectors nationally and internationally. International coverage coverage expanded to incorporate 600 top Canadian non-bank companies - see our coverage page for further details. Full historical data is available using our charting tool. Firstknow.It credit correlation data and implications for CDO valuations presented at the Reuters Brightspot conference in Singapore and the Pacific Prospect Structured Products Forum in Seoul. International coverage expanded to incorporate 1,750 top Japanese non-bank companies. Full historical data is available using our charting tool. FirstKnow.It signs a collaboration agreement with Reuters Plc. The revenue-sharing agreement will see Reuters delivering FirstKnow.It credit analysis to its user-base through its financial information products and marketing FirstKnow.It data through its offices world-wide. As part of the agreement, Reuters will supply the input data required to operate and develop the FirstKnow.It credit models. In preparation for Basel 2, preparation of Gini analysis on FirstKnow.It default probability data over 3 years. Produces Gini coefficients of 91.6% for US historical volatility analysis service and 93.0% for US implied volatility service, with Gini coefficients of 72.7% and 73.7% for UK and French services. (100% being perfect prediction). Click here for quarterly US analysis and here for annual US, UK and French analysis. Anwaltskanzlei Strick, the leading German credit organization is serializing a series of articles by Dr. Andrew Bagley of Baywood Investments on "Company Share Prices As a Guide to Future Insolvency". The articles are scheduled in the January, April and July 2003 editions of Strick's new journal Der Credit Manager. Click here for an English version or here for a German version. Our German coverage is further expanded. Our US implied volatility service is now available. We now perform US credit evaluations on both a historic and implied asset volatility basis. Rating grade intervals now determined by Prospective Default Frequency (PDF) using intervals typical of those applied by the principal rating agencies. International coverage expanded to incorporate 700 top US non-bank companies - see our coverage page for further details. Full historical data is available using our charting tool. Prospective Default Frequency (PDF) is now available, estimating the probability of a company defaulting during the rating horizon based on stock price data. Our advanced charting feature is now active: you can gain additional credit insights by plotting charts of historical put values and PDF's . FirstKnow.It is ahead of the traditional rating agencies again with its re-rating of Marconi. Our stock-based system downgraded Marconi into the CC band on 15th March, almost six months before Moody's or S&P began their downgrades. Click here to see a graph of FirstKnow.It's rating since February. The watchlist feature is now active. Now you can set up and revise a portfolio of companies you want to follow and have these companies presented whenever you visit www.FirstKnow.It. International coverage expanded to include 340 of the top non-bank companies listed on the German Stockmarkets. Dr. Andrew Bagley of Baywood Investments is to speak and give a workshop on "Company Share Prices as a Guide to Future Insolvency" at the Institute of Credit management Credit Management Forum on 19th September at theWoodside Conference Centre, Kenilworth, Warwickshire UK. The Institute of Credit Management journal, CREDITmanagement is to publish a series of articles by Dr. Andrew Bagley of Baywood Investments on "Company Share Prices as a Guide to Future Insolvency". The articles are scheduled in the August and September editions. Click here to download a copy. The Association of Corporate Treasurers journal, the Treasurer is to publish a series of articles by Dr. Andrew Bagley of Baywood Investments on use of options theory in credit evaluation. The articles are to be scheduled in the June/July&August editions. Click here to download a zipped copy. FirstKnow.It incorporates Equity Equivalent Position (EEP) into ratings. This unique feature enables the risk of debt exposures to be translated into positions in the equity of the company with equivalent risk. EEP expressed as equity position equivalent to 1,000,000 (£/DM) debt exposure. FirstKnow.It coverage expanded from 550 to 850 UK listed companies including many from AIM. FirstKnow.It anticipate continued development of our services and coverage. Please fill in the form below to subscribe to our mailing list. Mailings will to be occasional and user information will be treated as confidential. Fields marked * are required fields and must be completed.